We hope that you find the information on this website of use to you whilst you are arranging your loved ones Funeral. 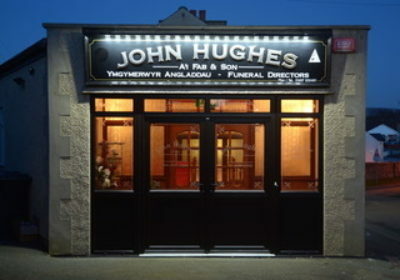 At John Hughes & Son we are here to help you 24 hours a day, 7 days a week. It is our belief that every funeral is as important as any other. We know the bereavement process can be very difficult and what families have to go through when they lose their loved ones. And we understand that the funeral service you are having to arrange and the grief that you feel is unique to you and your family. We will endeavour to carry out your instructions and your loved ones’ final requests in the professional, caring and respectful manner for which the company is known for, ensuring that the day of the funeral service is managed in a discreet and efficient manner.